This flounder spoon is ideal for catching flatfish species, such as plaice, Dover sole and of course flounder, from sandy beaches. 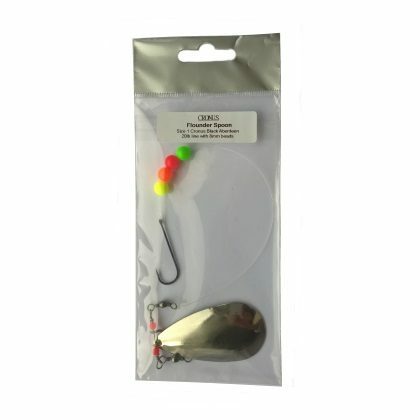 The product consists of a silver flounder spoon attached to a length of clear monofilament fishing line which is fitted with four 8mm beads. The line terminates in either a size 1 Cronus Black Aberdeen hook or a size 2 Cronus Flatfish hook. When the hook is baited with a ragworm or similar bait and reeled slowly over a sandy seabed the spoon will move and revolve, reflecting light and kicking up sand and sediment from the seabed. This – along with the visual attraction of the beads – attracts inquisitive flatfish species and is a much more effective technique than using bait alone. Sold in individually priced at £1.79.